Founded in 1990, Zegrahm Expeditions offers both overland and small-ship cruising to destinations all over the world. Even on cruises to Europe, the company offers expedition-style visits, which include both educational and adventurous experiences led by expedition leaders from all kinds of backgrounds. Zegrahm sails to all seven continents including voyages to Africa, Antarctica, Asia and India, Australia and the South Pacific, Central and South America, Europe and the Far North and Arctic. Based in Seattle, Zegrahm Expeditions is part of a larger company that also operates Quark Expeditions and International Expeditions. 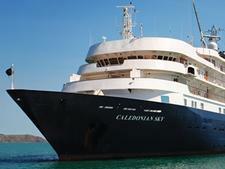 All-suite 100-passenger Caledonian Sky brings a "country house" feel to expedition cruising. Owned by APT, the ship is regularly chartered by Zegrahm. As with most expedition cruises, life onboard Zegrahm's sailings is informal and packed with learning -- from onboard lectures and documentary film screenings to scenic sightseeing while sailing to active land-based excursions such as birding, nature walks, snorkeling and diving. Depending on where you're sailing, cultural activities -- like wine tastings and dance performances -- might also be included. Zegrahm cruises are all-inclusive, meaning everything from your daily activities, lectures and tours to meals, transportation (not air) and gratuities are included in the price. Additionally, beer and wine are offered at lunch and dinner. Travelers attracted to Zegrahm Expeditions come primarily from North America, are mostly retired and solidly in the baby boomer age group (60-plus), and are well educated with extensive travel experience. Zegrahm's fleet consists of 10 chartered boats and ships that hold anywhere from 28 to 100 passengers. Each ship offers all river- or all ocean-view cabins and suites. Among the lines that Zegrahm charters ships from are APT, Coral Expeditions, Quark, Ponant, Silversea and Variety Cruises.